As a representative of St Andrews on the Military Education Committee (MEC), which administers the University OTC and the Air Squadron of four Scottish universities, last month I attended the Annual Formal Inspection at Leuchars base. 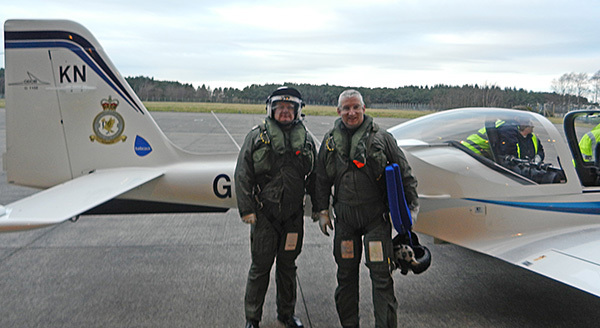 I was also given a 55 minute flight over Fife in a Grob 115E (Tutor T1), piloted by Flt Lt Roy MacIntyre. Unlike on previous occasions, I was more concerned to fly over archaeological sites than to actually fly the aircraft myself. Roy was certainly up for it and we visited a straw-poll of antiquities dating from the Bronze Age to the Cold War. First we headed west along the north coast towards Abernethy (one of the few Early Mediaeval round towers in Scotland, plus a Pictish stone nearby) in order to circle Carpow. This Roman legionary base had the northernmost stone architecture, with stone sculptures and inscriptions, in the Roman world (Keppie and Arnold 1984, No. 171-72; Dore and Wilkes 1999). 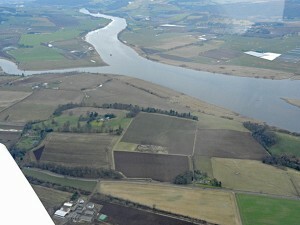 It is also one of the very few sites, which may be confidently linked to the campaigns of Septimius Severus and his son, Caracalla (together with Cramond west of Edinburgh, and South Shields, Tyne and Wear). Other military installations further north were built of turf and timber, and thus have no accompanying carved stonework (the stone skin around the defences of Inchtuthil in Perthshire does not really count!). Then we headed south to Falkland and ‘The Paps of Fife’ with good views of the Royal palace and Iron Age hill fort above (Dunbar 1999, 21-38). Along the south coast we paid particular attention to the Second World War archaeology of air bases, and the Cold War nuclear shelter complex (Scotland’s ‘Secret’ Bunker). The latter has so many ventilation structures in the surrounding fields that the Russians would have had no problem in spotting it, and the plan, after nuclear MADness, to repopulate the world with the descendants of Scottish local politicians and their secretaries would have been still-born! Next we circled St Andrews where work on the main university quad showed up as a brown mud square, and we peered down into my back garden on the south edge of town. After a touch-and-go back at Leuchars base, we observed the nearby castle mound and fine Romanesque church, before hugging the coast round to Tayport and back. The latter exercise was an inspection of the Second World War defences which run along the beach and inland, with lines of anti-tank obstacles and pill-boxes still clearly visible (Barclay 2013, 246-54). This stretch of coast is important for studies of coastal movement and erosion precisely because the exact date of construction is known, and many of the concrete anti-tank cubes are now in the sea. The high points of the flight were many, but Carpow and the beach-defences were particular delights. Flying over a landscape with oblique aerial views is very different from the usual archaeological work with vertical aerial images and the amazing facility that is Google Earth. Thus this trip was very valuable for appreciating the geomorphology and ‘texture’ of Fife in general, and the richness of Fife’s archaeology in particular! In connection with Fife’s archaeological heritage I should draw attention to the British Museum Exhibition now on at the McManus Gallery, Dundee, Roman Empire: Power and People. This runs until 10th May 2015, and features a number of artefacts excavated at Carpow. These include the best-preserved pieces of scale armour found in the Roman world west of Syria (Coulston 1999)! Inscriptions and sculptures, a massive, near-complete olive oil amphora, and other Carpow items are also on permanent display. I am very grateful to the MEC and the RAF for organising this trip, and to Roy for his piloting and enthusiastic company!